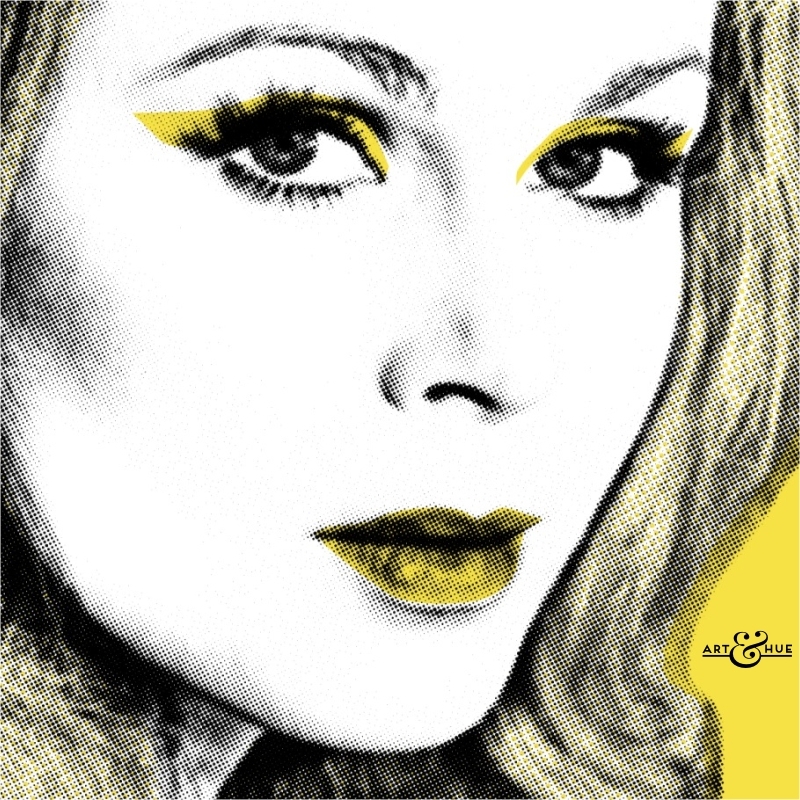 Art & Hue presents a new collection of stylish pop art prints inspired by the absolutely fabulous model, Bond-girl, and Avenger, Joanna Lumley. Elegant, charming, & funny, it’s no surprise that Joanna Lumley has had such a long and successful career – with her distinctive voice and twinkling eyes, there’s simply no-one else like her. 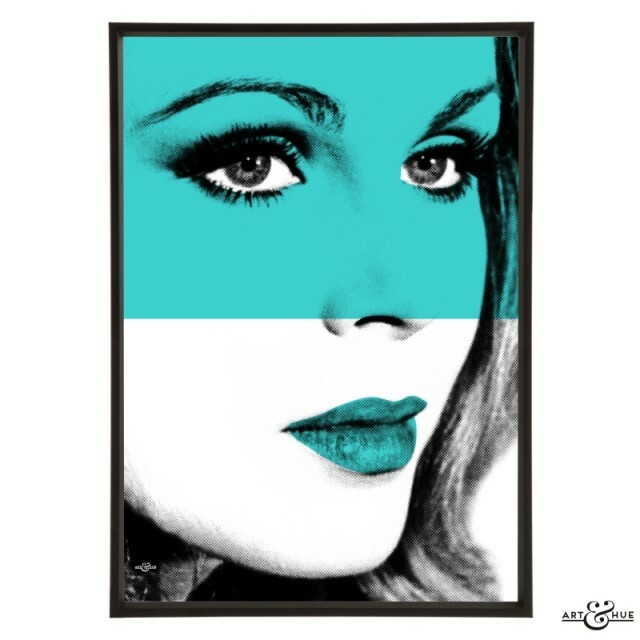 An official collaboration with Studiocanal, Art & Hue is pleased to release this new collection of six stylish pop art prints featuring national treasure Joanna Lumley. Available in 18 colours, including the 16 studio colours plus a light grey and black-and-white for monochrome purists, the fine art prints come in three sizes that fit widely-available picture frames. Since the 1960s onwards, Joanna Lumley has left her mark on each decade in iconic productions that endure to this day, most gaining a cult following and lifelong fan-base. In 1969, Joanna draped herself elegantly into an armchair on Piz Gloria playing a glamorous Bond-girl in fan-favourite “On Her Majesty’s Secret Service”, which also starred fellow-Avenger Diana Rigg. Unlike Honor Blackman and Diana Rigg, Joanna Lumley appeared in a James Bond film before becoming an Avenger and working with the quintessential gentleman, Patrick Macnee as John Steed. Purdey kicked her way across our screens, and into our hearts, in 1976 with a fashion-forward haircut which sparked a trend, although the producers weren’t happy initially as the publicity photos to promote “The New Avengers” were taken when Joanna had long hair. Purdey was a strong and modern woman, continuing the legacy of “The Avengers” to empower and inspire young viewers. One of Joanna’s most unique roles was as a Time-Agent with The Man from Uncle’s David McCallum in the sci-fi series “Sapphire & Steel”. Her eerie other-worldly character hitched more fans to the Lumley wagon and with good reason – her captivating performance and shining eyes made the show an instant cult-classic. Solidifying a reputation as “posh totty” through the 1980s, with memorable appearances in The Pink Panther films, “The Kenny Everett Show” and “Shirley Valentine”, Joanna also made her mark alongside broadcasting legend Terry Wogan, to raise funds for Children in Need, just one of the charitable and social causes she has helped over the years. It was in the 1990s however that “La Lumley” was finally able to let her comedy talent really shine. Comical sketches on Ruby Wax’s show “The Full Wax” led to the most perfect casting when Jennifer Saunders created the role of Patsy Stone in the instant-classic, “Absolutely Fabulous“. Patsy Stone, 42, is the tough fashion magazine editor, with Ivana Trump’s beehive hairstyle, who enabled and encouraged Ab Fab Edina Monsoon to shop, drink, smoke, and party, all whilst skiving off work. Living above Oddbins or in Eddie’s utility room, the intimidating “Fash-mag slag” frequently created trouble for all those around her, from falling asleep with a cigarette to selling her friend’s daughter. Last decade saw her star in the critically-acclaimed comedy drama “Sensitive Skin” as well as becoming the champion of the Ghurkas, the Nepalese soldiers who fought with the British army, when she joined the Gurkha Justice Campaign. Her involvement helped secure Ghurkas the right to move to Britain with pensions equality through a high-profile campaign which created comical scenes in Westminster. When she berated the then-Minister for Immigration, it was as if a teacher was chastising a naughty schoolboy. In recent years, she has worked with acclaimed director Martin Scorcese and actor Leonardo DiCaprio in “The Wolf of Wall Street” and presented documentaries on ITV, travelling to Egypt, Greece, Russia, Iran, and Memphis, Tennessee, to discover more about Elvis Presley and Graceland. It’s testament to her natural charm that whatever the documentary topic is, she remains highly watchable, engaging, and enchanting. Art & Hue had the pleasure of browsing Studiocanal’s extensive library of production and publicity photography at Pinewood Studios to discover rare vintage photographs of the actress in the early years of her career, which have been given the stylish pop art treatment. Delightful portraits that wouldn’t have looked out of place in Razzle, Booberella or Black Bond Meets Emmanuelle (all projects from Patsy’s youth), the pop art is inspired by the 1970 comedy film “The Breaking of Bumbo” about the late-1960s protest movement and Swinging London. If Andy Warhol had met Patsy Stone, he surely would have been charmed into creating pop art of the striking “girl-about-town”. Unlike traditional posters, all Art & Hue prints are acid-free and of museum quality, produced on 310gsm archival matte card, made from 100% cotton, with fine-art pigment inks for longevity. 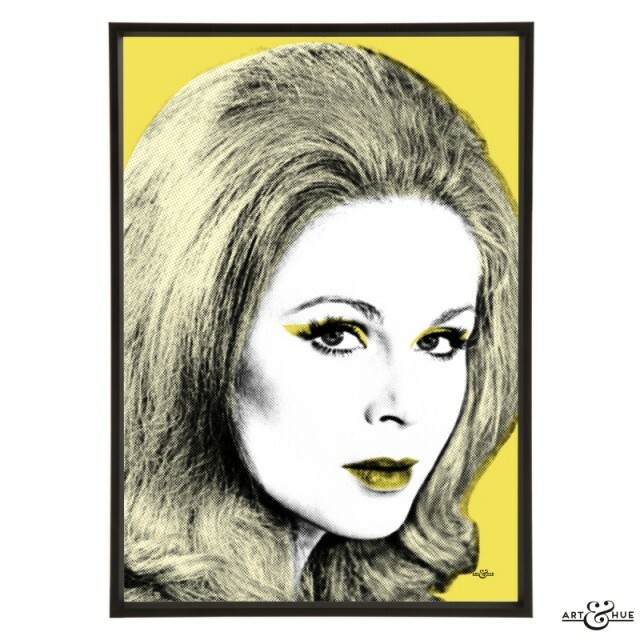 Available for a limited time, browse the full Art & Hue presents Joanna Lumley collection below.